The Pets in the Classroom grant program invites pre-kindergarten through 9th grade teachers to enter their 4th annual Lesson Plan Contest. Now through August 1st, teachers can submit their lesson plan ideas that center on the use of fish, reptiles, and small animals in the classroom in the form of worksheets, photos, PP presentations, fliers, or any written lesson plans. The winner of each category will win a $100 gift card. Categories are: Small Animals/Birds (One each for PreK-2, 3-5, 6-9), Reptile/Amphibian (One each for PreK-2, 3-5, 6-9), Aquarium/Fish (One each for PreK-2, 3-5, 6-9). The 9 winners will be announced August 21st. 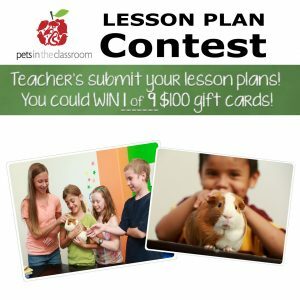 Select entries will once again be featured on the Pets in the Classroom website, allowing teachers to utilize and adapt lesson plans for their own use in their classroom. The Pets in the Classroom grant program provides grants to Pre-Kindergarten through 9th grade teachers in both private and public schools for the purpose of purchasing and maintaining classroom pets. Classroom animals are wonderful resources for teachers that, when incorporated into lesson plans, can have a profound impact. Classroom pets not only provide excitement in the classroom, but they also benefit students by teaching them responsible, long-term pet care at an early age and providing the psychological and developmental benefits associated with the human-animal bond. Studies have shown that caring for pets has a positive effect on children, improving school attendance and teaching children responsibility, as well as encouraging nurturing and building self-esteem. For more information on the Pets in the Classroom grant program or the Curriculum Contest, visit www.PetsintheClassroom.org.